Named after Ellen Willmott, a gardener since the tender age of 7 in 1865, and the heiress and garden maker of the celebrated Warley Place in England. This garden, like most, proved ephemeral and little survives, but Miss Willmotts' ghost thrives in gardens all around the globe. A biennial to short-lived perennial for well-drained, even sandy soil. Summer bloom. The cone centers are surrounded by spiny, silver-gray bracts. Slow erratic germinator. Self sows. Biennial to short-lived perennial. Starting Indoors: Sow indoors in winter. Keep at 70°F for 3 weeks, then ~40°F (in fridge) for 4-6 weeks, then 55-65°F. If there is no germination after 30 days, repeat the warm/chill cycle. Starting Outdoors: Direct sow in late summer to fall. 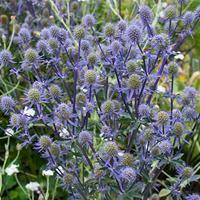 Sea holly is great for dry areas and is used for xeriscaping—great for rock gardens or borders that tend to be dry. It grows easily in dry, sandy, well-drained soils in full sun and can tolerate poor soils. Sprinkle some fine gravel around the crowns to allow for proper drainage during wintertime. Do not divide, as this plant has a taproot that should not be disturbed once established. Self sows, sometimes too abundantly, so cut most to the ground after flowering. Soil pH: Prefers acidic to neutral soils. Fertilizer: Do not fertilize during the first year of establishment. Subsequently, a springtime application of organic granular fertilizer or a 1/2" layer of compost. Diseases & Pests: No major pests or diseases. If aphids appear, spray plants down with a stream of water daily until pests are no longer present. Occasionally, slugs or snails may be a problem—apply pelletized iron phosphate or some diatomaceous earth to the surrounding soil. Plant: Silvery-green rosettes of basal leaves that are oblong and deeply toothed. Flowering: Iridescent silvery egg-shaped flower heads made up of tiny flowers, surrounded by a spiky collar of silver bracts. Flower heads appear on stiff, heavily branched stems arising from the rosette. Wonderful in cut flower arrangements, fresh or dried. Seeds: The tiny flowers turn into individual bluish-brown fruits less than 1/10” long. Does not produce viable seed. The genus name Eryngium comes from a name used for a plant in ancient Greece, most likely Eryngium campestre.